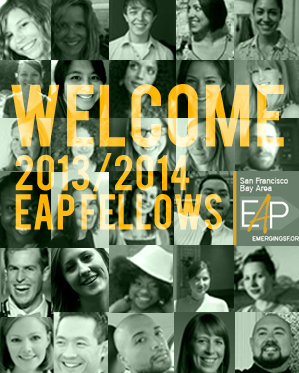 Meet the new crop of Emerging Arts Professionals fellows joining us for the 2013/14 session. 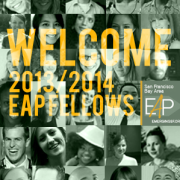 A bright bunch with a diversity of interests and affiliations, the fellows will work over the next nine months to fulfill—and shape—EAP’s mission. For the 2013/14 session, we’ve broken out four key areas of inquiry based on feedback from the network. Working in and across teams, the fellows will dig into these four topics to ask probing questions, produce a body of knowledge, and mine existing resources in the network to uncover information and make connections. The fellows will also explore a rubric for arts leadership, identifying and sharing the best practices of four distinct types of leaders: connectors, content creators, team leaders, and visionaries. We’re thrilled to welcome this ambitious, curious group and look forward to all they will accomplish. Gina Acebo, (former) Network Coordinator, Applied Research Center; Sheeka Arbuthnot, Curator & Assistant Director, Meridian Gallery; Claire Frost, Curatorial Assistant, Contemporary Jewish Museum; Adriana Griñó, Curatorial & Special Programs Manager, Galería de la Raza; Jessie Johnston, Development Associate, Quinn Associates; Tossie Long, Musician, Research Associate, PBI Associates; Carrie Leilam Love, Bayview Community Artist in Residence, WritersCorps / SF Arts Commission; Adriana Marcial, Development & Communications Manager, Joe Goode Performance Group; Hannah Merriman, Co-founder, Fortnight Collective; Cultural Agent, US Department of Arts and Culture; Lisa Nowlain, MLiS Candidate, San Jose State University; Learning Commons Intern, Exploratorium; Jen Ontiveros, Development Coordinator, di Rosa; Alex Randall, Operations Manager, Bloomboard; Leah Reisman, Assistant Research Specialist, Lawrence Hall of Science; Malia Rose, Education & Public Programs Assistant, San Francisco Museum of Modern Art; Brittney Shepherd, Independent Media Maker; Matt Sussman, Marketing & Development Associate, Bay Area Video Coalition, Associate Editor, Art Practical; Tavia Stewart-Streit, Deput Director, Office of Letters & Light; Founder & Executive Director, Invisible City Audio Tours; Victor Valle, Founder, We Move Against The Tides; Manager, VCV Artist Management; Writer, The Deli SF; Caroline Walthall, Development Associate, ODC/Dance; and Madeleine Wilhite, Operations & Special Events Manager, Headlands Center for the Arts.